Perfectly nerve-racking, at times, but perfect it is as Jennifer Jones and Team Canada are Olympic gold medallists, leaving the Sochi Games with a flawless record of 11 and oh. Dodging bullets almost every step of the way of their gold medal game against Sweden, Canada ( Kaitlyn Lawes, Jill Officer and Dawn McEwen round out the squad) settled down after a Houdini act in the fifth - an end that could have seen their gold medal dreams smashed to smithereens - and came away with a 6 - 3 win that was powered by a determined skip who made clutch shots at almost every turn. Jones' performance at these games has been superb throughout and she was fantastic again in the final, cementing her place as one of the great skips of all time. "Unbelievable," said Jones, in her post game interview with CBC. "We had the best week of our lives in the biggest event that we can play in and we played our best. And you couldn't ask for anything more than that." Battling the opposition and, at times, two her own teammate's less than stellar play, Jones repeatedly put those teammates on her back and carried them to the top of the podium, with a curling clinic kind of performance. When she made the final hit in the tenth to run Sweden out of rocks, Jones smiled, started to cry and raised her hands in the air. The moment signaled that Jones' Olympic plan had come to perfect fruition. The most important shot Jones made in this game came in the ninth end. With Canada up by one and Sweden holding hammer, she calmly and coolly planted her final draw in exactly the right spot, biting the button. It forced Swedish fourth Maria Prytz - who had a marvelous game herself - into a difficult, difficult shot to even get one. As it was, with some pretty poor sweeping by her teammates, Prytz's stone over curled and left Canada with a steal of two and a 6 - 3 lead, heading for the tenth. At that point, it was just a matter of removing Swedish rocks in routine fashion and the gold medal was in the clutches of a Canadian women's team for the first time since Sandra Schmirler's rink won it all at Nagano, in 1998. There were moments of nervousness for Jones and her team. Plenty of them. The biggest of which came in the fifth end, which was the sea change end of this game. With a bad situation building for Canada and Sweden holding the hammer, Jones did her best to bail out her team. As it was, Prytz had a double for four, which would have given Sweden a 5 - 3 lead at the break. She missed the double - not by much at all - but the difference was two points and the game was tied at three. That close shave didn’t seem to rattle Jones, who was all smiles during her mid-game interview. “We just haven’t been getting our rocks in the best spots but we’re going to try and change that in the second half and see what happens. But we still have control,” she said. Out of the break, Jones and her teammates had obviously decided to settle things down, playing a conservative style that led to blanks in the sixth and seventh ends, holding hammer into the eighth end. In the eighth, another dodge and weave. Looking to score a deuce and take control heading for the final two ends, Jones was left with a delicate tap to try and score those two points. When Prytz planted her last shot of the end in perfect position, it was questionable as to who was actually lying shot stone. Jones’ final shot then came up short, and after a measurement, Canada scored one, by a couple of millimetres and took a 4 - 3 lead. There was another close call, right off the top. In the first end, near disaster. Had it turned out a little differently, Jones and her mates would have been down 3 - nothing from the get go and those three points would have been a steal. Playing the end wide open, it seemed a typical blank end was coming. When the Swedes came up short on a draw to the rings, Jones did what she's always done; she played it aggressively. She called a come around which eventually led to her needing to make her last shot of the end against three counters. The hit attempt was successful, but not by much. First, flirting with a centre guard, Jones' rock made the takeout and rolled. However, it stopped in time for a score of one. Early ice conditions seemed a puzzle for Canada. After Jones' first stone of the third took off a bit on her, she was heard to say "that really curled," in a disbelieving tone. It had happened a number of times to them previous to that and led to some difficult situations. Jones, who led all skips coming into this game with a shooting accuracy of 86%, brought her game to higher level for this one, booking an 88%, remarkable considering the number of difficult shots she stared down. McEwen, who fired at 92% efficiency through the tournament, was just about perfect at the lead position, recording a scintillating 99% rating for the gold medal game. Officer and Lawes, who had also been stellar throughout, stumbled at times in the gold medal game. After beginning the first two ends with a 25% rating, Lawes ground it out and slowly but surely improved, climbing to 68%, far off her tournament numbers of 81%. Officer, who alternately shot brilliantly (including one triple takeout) and not so brilliantly, came in at 76%, off her week long average of 83%. Jones' and her team's unbeaten run to Olympic gold is only the second time it's ever happened. 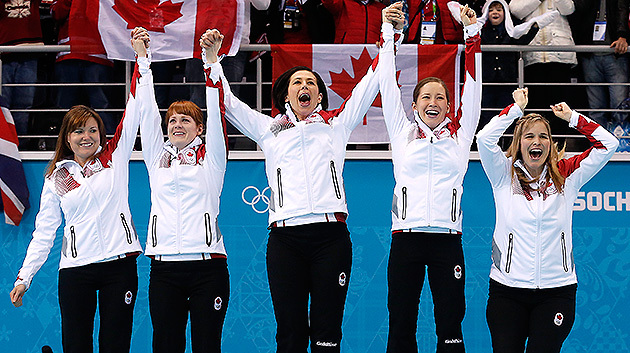 After making history as the first women's team to earn a perfect round robin record at the Olympics, they join Canada's Team Kevin Martin as the only ones to go through an entire Olympics without a loss. Coupled with their performance a the Canadian Olympic Trials, the Jones team accrued a record of 18 and 1. Now, Brad Jacobs and the Canadian men will get their stab at a gold medal. Facing Great Britain, skipped by two-time world champion David Murdoch, Jacobs and his teammates will try to make it three Olympic championships in a row for Canadian men (Martin, 2010 and Brad Gushue, 2006). The men's gold medal game will be played Friday at 8:30 am, Eastern time, and can be seen on CBC.